Sept. 18, 2012, 10:46 a.m.
One-size-fits-all classes don’t work in an environment where students’ digital skills are so uneven. And journalism schools should be looking to serve the world beyond those who pay tuition. By Jeff Jarvis Sept. 18, 2012, 10:46 a.m.
We asked an array of people — hiring editors, recent graduates, professors, technologists, deans — to evaluate the job j-schools are doing and to offer ideas for how they might improve. Over the coming days, we’ll be sharing their thoughts with you. Here Jeff Jarvis — CUNY journalism professor, media analyst, and industry veteran — describes a vision for a significantly restructured system for journalism education. Disruption in journalism education — just as in the profession of journalism — is as inevitable as it is deserved. It also presents great opportunities. Speaking for myself and not necessarily for my school, here is a notion of what journalism schools can and should be doing. We must take advantage of new ways to teach and we certainly have new skills to impart. Like other disciplines in universities, we need to explore new efficiencies so we can lower the cost of an education and stop bankrupting our students’ futures. We should help educate a public that can finally participate in journalism and re-educate professionals left behind by change. And we must not only adapt to a radically new reality in media, we have a responsibility to help shape it. In addition, educational institutions in journalism need to contribute to innovation in the field through research and incubation. At CUNY, we find that classroom instruction is proving to be less and less viable as a means of teaching digital media tools. We have found that the gap in media skills of incoming students is widening, making it difficult to tailor a class to serve all students equally well. We have also found a widening gap of ambition. Some students want more tools than can fit into a curriculum designed to answer the needs of every student. And we face a constant tension between using precious classroom and faculty time to teach tools vs. journalism. Finally, we see that too much classroom time is spent solving students’ individual questions, which is critically important to make sure all students are up to speed but which also holds back other students. Setting outcomes based on goals: For a student to learn how make web video, for example, we need to research the necessary skills and list the functions and concepts students are required to learn, tool-by-tool and step-by-step. Researching these outcomes will be invaluable in understanding the needs of the industry and preparing students for opportunities in jobs and startups. Curating online instructional tools: There are already many good ways to learn tools through services such as Lynda, videos on YouTube, and, yes, textbooks. Students should be free to select the tools that help them learn best so long as they meet the required outcomes. The more we curate these instructional materials and the less we create them, the better. Tutoring: Imagine a Genius Bar with faculty and certified students available to answer to questions or to provide individual or small-group instruction that helps push students’ ambitions. Providing journalistic context: Faculty set the frame of reference for the journalistic use of these tools through the selection of assignments and through classroom instruction and discussion. Certification: Students should prove their competency with these tools not through tests but through creating work for their portfolios, which could be judged by experts against a set of established criteria. Understanding the journalistic uses of a tool. A student may learn what HTML5 can do in creating interactive experiences without programming them, making the student a more informed and creative member of a newsroom or startup team. The ability to specify use of a tool. The student can work directly with a developer to spec, say, a data visualization. The ability to adapt templates or code. The student can take an application or a design and adapt it for a particular use. The ability to create. For example, a competent web video student will be able to do everything needed, from camera work through editing and distribution, to make a quality video. Certified expertise. A student is certified as an expert in a tool, capable of teaching the tool and its uses to others in the school and the workplace. These students can help staff the Genius Bar. Note well that first two tasks above — setting outcomes and curating instructional tools — should be done openly for anyone’s use: students, other universities and schools, professionals, anyone. The next three tasks — setting context, tutoring, and certification — are areas in which schools add value for their own students. I hope that such a method would allow students to learn at their own pace and level, establish and test clear outcomes, increase options for students, free up classroom time for journalistic instruction, and reduce the cost of education. At CUNY, we have a problem, a good one. Our required and paid summer internship program has become a centerpiece of the school’s program. Students return from a summer of work changed, understanding the context of their study. But through the year, there aren’t enough internships to meet demand and many of the internships that exist are not sufficiently structured to assure outcomes. So why not make more internships? Here is where the teaching-hospital model enters. I believe that journalism schools should work with existing media enterprises and even create their own media enterprises in undercovered areas to provide the means for more practical education alongside both professionals and faculty. I also long for more opportunities to teach interactive journalism through interaction with a community. I have been helping a respected media entrepreneur in New York who is raising investment capital to start a large-scale local enterprise that could provide a wonderful laboratory and classroom for our school. (It’s also a good business. Interested in investing? Ping me.) In New Jersey, where I live, Montclair State University has invited media outlets including NJTV, WNYC, NJ Spotlight, and NJ.com to share space on campus and I’ve worked with them in starting an NJ News Commons to support independent members of the ecosystem with training, services, distribution, and collaboration. In both, I see tremendous opportunities to bring in students to work and learn. But both require investment. I’ll say less about this because I hope it is self-evident that we must continue to teach the eternal verities of journalism — as my dean, Steve Shepard, puts it — while also updating the ways in which we lead students to consider journalism’s role in society. The history, law, ethics, standards, and methods of journalism all require study. Today, we also need to teach students to embrace disruption and find opportunity in it. And we need them to understand how they can add journalistic value to a flow of information that can now go on without them, thanks to the Internet. Since starting the Tow-Knight Center for Entrepreneurial Journalism at CUNY, I’ve come to better appreciate the need for research and development. We’ve issued reports on opportunities with local advertisers, on new revenue sources for local sites, on business models in a city’s news ecosystem, on unexplored technology opportunities, and more. I’m delighted to say that I’ll now be working with my CUNY colleague C.W. Anderson on executing much more research, bringing together the industry and the academy, professionals and academics, to study current problems and opportunities and also to break out of legacy assumptions so we can imagine new envision new forms, relationships, and business models for news. I’m still struggling to find the right role for a school in helping launch new businesses. At CUNY, my colleague Jeremy Caplan and I teach entrepreneurial journalism as much to teach students the business of journalism as to help them create their own companies and jobs. How much should we become an incubator for their businesses and those of other entrepreneurs? Should I raise a venture fund? I’m still investigating those questions. I do know that our industry needs the kind of entrepreneurial help that the technology industry has received from universities including Stanford and MIT. After all this, what does a journalism school look like in a few years? I think it will still have classes and graduates who learn old and new skills. But I also hope it will become a more distributed institution that doesn’t create all of its own instruction, but works with others’ resources; that teaches many more people than its own enrolled students; that contributes journalism to its community by working with news enterprises; and that becomes a laboratory for journalism, providing research and development for an industry that is mostly too battered and poor to do its own. Photo by Re:Publica 2012 used under a Creative Commons license. POSTED Sept. 18, 2012, 10:46 a.m.
Jarvis, Jeff. "Jeff Jarvis: Here’s a blueprint for radical innovation in journalism education." Nieman Journalism Lab. Nieman Foundation for Journalism at Harvard, 18 Sep. 2012. Web. 19 Apr. 2019. Jarvis, Jeff. 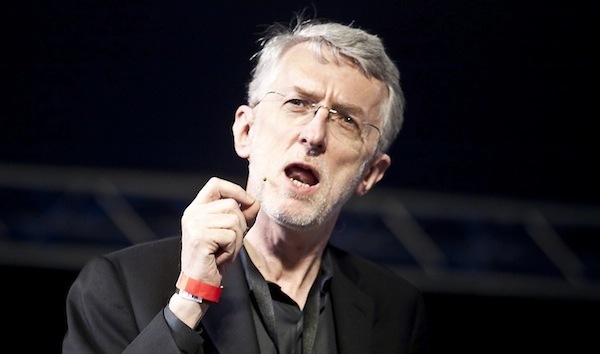 "Jeff Jarvis: Here’s a blueprint for radical innovation in journalism education." Nieman Journalism Lab. Last modified September 18, 2012. Accessed April 19, 2019. https://www.niemanlab.org/2012/09/jeff-jarvis-heres-a-blueprint-for-radical-innovation-in-journalism-education/.